A few years ago, especially in the 2005-2008 period, many people were concerned that the oil supply would run out. They were concerned about high oil prices and a possible need for rationing. The story was often called “Peak Oil.” Peak Oil theorists have also branched out into providing calculations that might be used to determine which substitutes for fossil fuels seem to have the most promise. What is right about the Peak Oil story, and what is misleading or wrong? Let’s look at a few of the pieces. What Is the Role of Energy in the Economy? The real story is that the operation of the economy depends on the supply of affordable energy. Without this energy supply, we could not make goods and services of any kind. The world’s GDP would be zero. Everything we have, from the food on our dinner table, to the pixels on our computer, to the roads we drive on is only possible because the economy “dissipates” energy. Even our jobs depend on energy dissipation. Some of this energy is human energy. The vast majority of it is the energy of fossil fuels and of other supplements to human energy. Peak Oilers generally have gotten this story right, but they often miss the “affordable” part of the story. Economists have been in denial of this story. A big part of the problem is that it would be problematic to admit that the economy is tied to fossil fuels and to other energy sources whose supply seems to be limited. It would be impossible to talk about growth forever, if economic growth were directly tied to the consumption of limited energy resources. What Happens When Oil and Other Energy Supplies Become Increasingly Difficult to Extract? Fossil fuel producers tend to extract the fuels that are easiest to extract first. Over time, even with technology changes, this tends to lead to higher extraction costs for the remaining fuels. Peak Oilers have been quick to notice this relationship. The question that then arises is, “Can these higher extraction costs be passed on to the consumer as higher prices?” Peak Oil theorists, as well as many others, have tended to say, “Of course, the higher cost of oil extraction will lead to higher oil prices. Energy is essential to the economy.” In fact, we did see very high oil prices in the 1974-1981 period, in the 2004-2008 period, and in the 2011-2013 period. Unfortunately, it is not true that higher extraction costs always can be passed on to consumers as higher prices. Many energy costs are very well “buried” in finished goods, such as food, cars, air conditioners, and trucks. After a point, energy prices “top out” at what is affordable for citizens, considering current wage levels and interest rate levels. This level of the affordable energy price will vary over time, with lower interest rates and higher debt amounts generally allowing higher energy prices. Greater wage disparity will tend to reduce the affordable price level, because fewer workers can afford these finished goods. The underlying problem is that, from the consumer’s perspective, high oil prices look like inefficiency on the part of the oil company. Normally, being inefficient leads to costs that can’t be passed along to the consumer. We should not be surprised if, at some point, it is no longer possible to pass these higher costs on as higher prices. If higher extraction costs cannot be passed on to consumers, this is a terrible situation for energy producers. After not too many years, this situation tends to lead to peak energy output because producers and their governments tend to go bankrupt. This seems to be the situation we are reaching for oil, coal and natural gas. This is a much worse situation than the high price situation because the high price situation tends to lead to more supply; low prices tend to collapse the production system. The underlying problem is that low prices, even if they are satisfactory to the consumer, tend to be too low for the companies producing energy products. Peak Oilers miss the fact that a two-way tug of war is taking place. Low prices look like a great outcome from the perspective of consumers, but they are a disaster from the perspective of producers. How Important Is Hubbert’s Curve for Determining the Shape of Future Oil (or Coal or Natural Gas) Extraction? Figure 1. 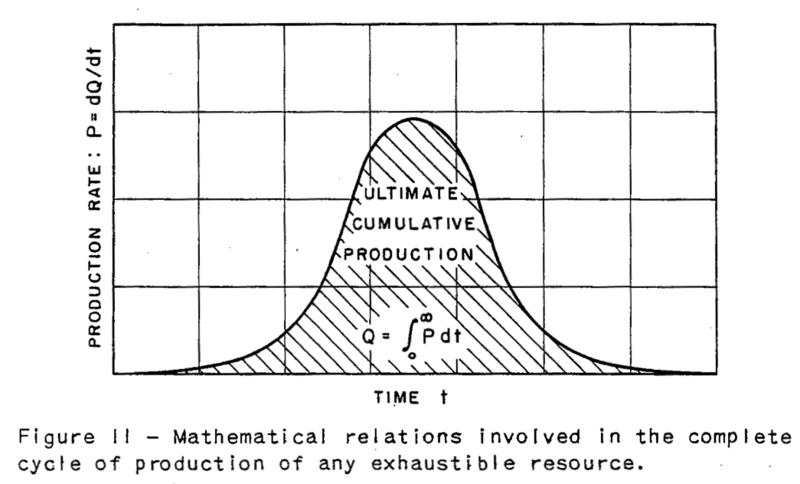 M. King Hubbert symmetric curve from Nuclear Energy and the Fossil Fuels. Total quantity of resources that will ultimately be extracted is Q. Most Peak Oilers seem to believe that if we see Hubbert shaped curves in individual fields, we should expect to see a similar shaped curve for total oil supply or for the supply of other fossil fuels. They think that production patterns to date plus outstanding reserves can give realistic views of the future extraction patterns. Frequently, Peak Oilers will assume that once production of oil, coal or natural gas starts to fall, we will still have about 50% of the beginning amount left. Thus, we can plan on a fairly long, slow decline in fossil fuel production. Figure 2. 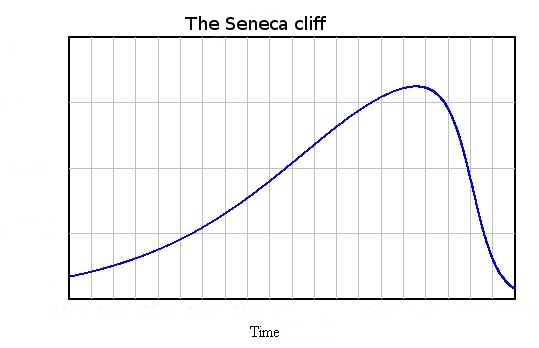 Seneca Cliff by Ugo Bardi. Peak Oilers also tend to limit the amount of resources that they consider extractible, to exclude those that are particularly high in cost. Even with these adjustments, it seems to me that the situation is likely to be even worse than most Peak Oil analyses suggest because of the interconnected nature of the economy and the fact that world population continues to grow. The economy cannot get along with a sharp reduction in energy consumption per capita. Some governments may collapse; many debtors may default; some banks may be forced to close. The situation may resemble the “societal collapse” situation experienced by many early economies. One concern I have is that the Hubbert model, once it became the standard model for what energy supply might be available in the future, could easily be distorted. With enough assumptions about ever-rising energy prices and ever-improving technology, it became possible to claim that any fossil fuel resource in the ground could be extracted at some point in the future. Such outrageous assumptions can be used to claim that our biggest future problem will be climate change. After hearing enough climate change forecasts, people tend to forget about our immediate energy problems, since current problems are mostly hidden from consumers by low energy prices. Is Running Out of Oil Our Biggest Energy Problem? The story told by Peak Oilers is based on the assumption that oil is our big problem and that we have plenty of other fuels. Oil is indeed our highest cost fuel and is very energy dense. Nevertheless, I think this is an incorrect assessment of our situation; the real issue is keeping the average cost of energy consumption low enough so that goods and services made from energy products will be affordable by consumers. Even factory workers need to be able to buy goods made by the economy. Figure 2. 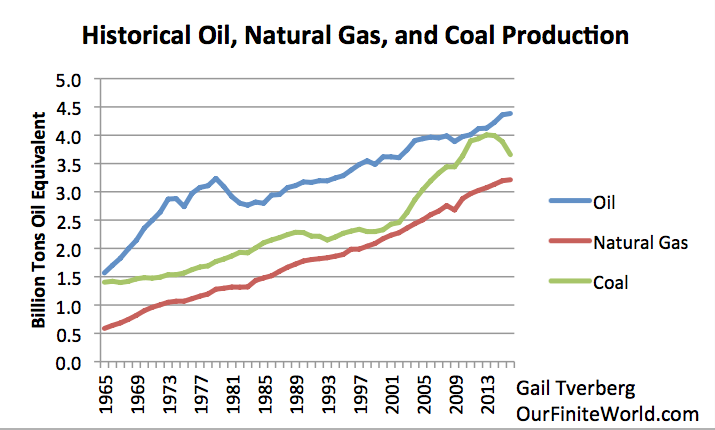 Historical oil, natural gas, and oil production, based on Statistical Review of World Energy, 2017. The way the cost of energy consumption can be kept low is mostly a “mix” issue. If the mix of energy products is heavily weighted toward low cost energy-related products, such as coal and labor from low wage countries, then the overall cost of energy can be kept low. This is a major reason why the economies of China and India have been able to grow rapidly in recent years. If underlying costs of production are rising, mix changes cannot be expected to keep the problem hidden indefinitely. A recession is a likely outcome if the average price of energy, even with the mix changes, isn’t kept low enough for consumers. Energy producers, on the other hand, depend on energy prices that are high enough that they can make adequate reinvestment. If they cannot make adequate reinvestment, the whole system will tend to collapse. A collapse based on prices that are too low for producers will not occur immediately, however. The problem can be hidden for a while by a variety of techniques, including additional debt for producers and lower interest rates for consumers. We seem to be in the period during which the problems of producers can be temporarily hidden. Once this grace period has passed, the economy is in danger of collapsing, with oil not necessarily singled out first. Following collapse, large amounts oil, coal and natural gas are likely to be left in the ground. Some of it may even cease to be available before the 50% point of the Hubbert curve is reached. Electricity may very well collapse at the same time as fossil fuels. How Should We Measure Whether an Energy-Producing Device Is Actually Providing a Worthwhile Service to the Economy? As I looked through the workings of the Limits to Growth model, it occurred to me that the EROI calculation needs to line up with how the economy really operates. If this is the case, we really need a very rapid return of the energy output, relative to the energy input. Also, in the aggregate, the energy output needs to scale up very rapidly. Furthermore, the energy output needs to match the types of energy needed for the devices the economy is currently using. If the output is different (such as electricity instead of fossil fuels), the EROI calculation needs to be adjusted to reflect the expected energy cost and time delay associated with a changeover in devices to match the new type of energy output. Of course, in a setting of many researchers working on a subject and many peer reviewed papers, a concept such as EROI is gradually modified and enhanced by different researchers. For example, EROI is turned around to become the Energy Payback Period. This is used to show prospective buyers of a device how helpful a particular device supposedly is. Researchers who are trying to “push” a type of energy product will find ways to perform the EROI calculation that are as helpful as possible to their cause. The problem, though, is that if more stringent EROI requirements are put into effect, wind and solar can be expected to do much less well in EROI calculations. They very likely drop below the threshold of being useful to the economy as energy producers. This is especially the case if they are added to the economy in great numbers to try to significantly replace fossil fuels. Regardless of their value as energy producers, there might still be a reason for building wind and solar. Building them probably does help the economy in the same sense that building unneeded roads and apartment buildings does. In theory, all of these things might someday be somewhat useful. They are helpful now in that they add jobs. Also, the building of wind and solar devices adds “demand,” which helps keep the price of coal in China high enough to encourage additional extraction. But in terms of truly keeping the world economy operating over the long haul, or in terms of scaling up to the quantity of energy supply that is really needed to operate the economy, wind and solar do very little. How Should Net Energy Be Defined? Net Energy is defined by EROI researchers as (Energy Output) minus (Energy Input). Unfortunately, as far as I can see, this calculation provides virtually no valid information. Instead, it promotes the belief that the benefit of a device can be defined in terms of (Energy Output) minus (Energy Input). In practice, it is very difficult to measure more than a small fraction of the Energy Inputs needed to produce an Energy Output, while Energy Output does tend to be easily measurable. This imbalance leads to a situation where the calculation of (Energy Output) minus (Energy Input) provides a gross overestimate of how helpful an energy device really is. If we are dealing with a fish or some other animal, the amount of energy that the animal can expend on gathering food is not very high because it needs to use the vast majority of its energy for other purposes, such as respiration, reproduction, and digestion. In general, a fish can only use about 10% of its energy from food for gathering food. Limits to Growth modeling seems to suggest a similar maximum energy-gathering usage percentage of 10%. In this case, this percentage would apply to the resources needed for capturing, processing, and distributing energy to the world economy. Perhaps there is a need for a substitute for Net Energy, calculated compared to the budgeted maximum expenditure for the function of “Energy gathering, processing and distribution.” For example, the term Surplus Energy might be used instead, calculated as (10% x Energy Output) minus (Energy Input), where Energy Inputs are subject to suitably wide boundaries. If an energy product has a very favorable evaluation on this basis, it will be inexpensive to produce, making it affordable to buyers. At the same time, the cost of production will be low, leaving plenty of funds with which to pay taxes. Alternately, Surplus Energy might be calculated in terms of the tax revenue that governments are able to collect, relative to the new energy type. Tax revenue based on fossil fuel production and/or consumption is very signification today. Oil exporting nations often rely primarily on oil-based tax revenue to support their programs. Many countries tax gasoline consumption highly. Another type of fossil fuel tax is a carbon tax. Any replacement for fossil fuels will need to replace the loss of tax revenue associated with fossil fuels, because taxation is the way Surplus Energy is captured for the good of the economy as a whole. (a) Prices to the consumer must be low enough to prevent recession. (b) Prices must be high enough that the producer of the replacement energy supply can earn adequate after-tax revenue to support its operations. (c) The mark-up between the cost of production and the sales price must be high enough that governments can take a very significant share of gross receipts as tax revenue. The only way that it is possible to meet these three demands simultaneously is if the unsubsidized cost of energy production is extremely low. Wind and solar clearly come nowhere near being able to meet this very low price threshold; they still rely on subsidies. One of the biggest subsidies is being allowed to “go first” when their energy supply is available. The greater the share of intermittent wind and solar that is added to the electric grid, the more disruptive this subsidy becomes. Afterword: Is this a criticism of Peak Oil energy researchers? No. I know many of these researchers quite well. They are hard working individuals who have tried to figure out what is happening in the energy arena with very little funding. Some of them are aware of the collapse issue, but it is not something that they can discuss in the journals they usually write in. The 1972 The Limits to Growth modeling that I mentioned in my last post was ridiculed by a large number of people. It was not possible to believe that the world economy could collapse, certainly not in the near term. Early researchers were not aware that the physics of energy extraction extends to the economy as a whole, rather than ending at the wellhead. Because of this, they tended to overlook the importance of affordability. Affordability is important because there is a pricing conflict between the low prices needed by buyers of energy products and the high prices needed by producers. This conflict becomes especially apparent as the world approaches energy limits; this conflict was not easily seen in the data reviewed by Hubbert. Once Hubbert missed the affordability issue, his followers tended to go follow the same path. Researchers needed to start from somewhere. The start that Peak Oil researchers made was as reasonable as any. They were convinced that there was an energy problem, and they wanted to convince others of the problem. But this was difficult to do. When they would develop an approach that they thought would make the energy problem clear to everyone, other researchers would modify it. They would take whatever aspect of the research seemed to be helpful to them and would tweak it to support whatever view they wanted to encourage–often with precisely the opposite intent to what the original researchers had expected. Thus, the approaches that Peak Oil researchers thought would show that there was a likely energy shortage ahead ended up being used to “prove” that we have an almost unlimited amount of fossil fuel energy available. It seems as though the world has such a strong need for happily-ever-after endings that self-organization pushes research in the direction of showing outcomes people want to see, even if they are untrue. 1. FCONRR is what I would call a calendar year “in and out” function. Forecasting EROI using a model year approach gives artificially favorable indications. FCONRR calculations line up fairly well with many fossil fuel EROI calculations, but not with the usual model approach used for capital devices used to generate electricity. 2. I would describe FCONRR as corresponding to “Point of Use (POU) EROI,” not Wellhead EROI. 3. If a newly built device causes a previously built capital device to be closed down before the end of its useful lifetime (for example, solar output leads to distorted electricity prices, which in turn leads to unprofitable nuclear), this has an adverse impact on FCONRR. Thus, intermittent renewables need to be evaluated on a very broad basis. 4. In the model, FCONRR starts at 5% and gradually increases to 10%. This is equivalent to overall average calendar year POU EROI starting at 20:1 and falling to 10:1. The model shows the world economy growing nicely, when total FCONRR is 5%. It gradually slows, as FCONRR increases to 10%. Once overall FCONRR exceeds 10%, the model shows the world economy contracting. 5. I was struck by the fact that FCONRR equaling 10% corresponds to the ratio that Charlie Hall describes as the share of energy that a fish can afford to use to gather its food. Once a fish starts using more than 10% of its energy for gathering food, it is all downhill from there. The fish cannot live very long, without enough energy to support the rest of it functions. Similarly, an economy cannot last very long, without enough energy to support its other functions. 6. In the model, necessary resources out depend on the population. The higher the population, the more resources out are needed. It is falling resources per capita that causes the system to collapse. This is why FCONRR needs to stay strictly below 10% and energy consumption must be ramped up rapidly. This would suggest that average POU EROI needs to stay strictly above 10:1, to keep the system away from collapse. 7. If there are not enough resources out in total, for a given calendar year, this becomes a huge problem. The way this works out in practice is that if a device uses a lot of upfront capital, these devices can sort of work out OK, if (a) only a few are built each year, (b) they have very high EROI, and (c) they last a long time. Thus, hydro and dams can work. But devices with an EROI close to 10:1 cannot work, especially if they need to be scaled up quickly and need a lot of supporting infrastructure. 8. Clearly, using the FCONRR approach, eliminating a high EROI fuel is as detrimental to the system as adding a low EROI device with a lot of upfront capital spending required. It is the overall output compared to population that is important. The quantity of output is even more important than the EROI ratio. This entry was posted in Financial Implications and tagged EROEI, EROI, limits to growth, M. King Hubbert, oil prices, peak oil. Bookmark the permalink. We can all guess what the impact of such a big sales program will have on the building of new buildings. It seems likely to depress prices for “used” real estate, making them more attractive than building new. If the state has unused buildings, my guess is that there are a fair number of other unused buildings. Its recent population growth seems to be negative, according to some reports. I country with fewer people needs fewer schools, fewer businesses in general, and fewer homes. Instead of economies of scale, the country reaches a situation where companies are frequently finding that overhead grows faster than sales. “The financial crisis of 2008-2009, the worst since the Great Depression, was hard on all Americans. But arguably no group felt its sting more than African-Americans, who were already the most economically and financially vulnerable segment of the population going into it. Even today, a decade since the Great Recession hit, blacks still haven’t fully recovered and remain in a precarious financial condition. The give away lending schemes especially benefited blacks. They received loans that they couldn’t really afford. When oil prices rose, they disproportionately defaulted on their loans. I know that in the Atlanta area, the parts most affected by the defaults saw bigger drops in home prices, and they didn’t rise again afterward as well either. The prices in those areas tended to be low to begin with. The growing wage disparity problem affected those buyers most. I found Atlanta pleasantly priced after traveling from the Bay Area. Of course, all those churches blocked the view. the world’s debt load is $247 trillion, 320% of GDP. Its GDP growth rate is not sufficient to cover the interest on that debt; and we have reached Peak. This will simply be a recession from which we will never exit. Collapse is such a harsh word! I understand your reservations in relation to eroie calculations. However, the topic is interesting and needs to be explained. I hope that you in one of your following posts will give your explanation as to a valid estimate of energy balance Energy In/Energy Out. I will try to give my thoughts on this subject in the following, but I especially hope that you will explain what is up and down in the matter. Each day I fill a bucket of water in the nearby spring. Energy In = human labour, Energy Out = zero, absolutely nothing. In this case you can hardly talk about energy balance apart from the use of human energy. I drill 10 meter down to a water source. The drilling costs 1000 dollars. It turns out that the well is a wellspring so I don’t need a pump. The well will be in use for 100 years without further costs. Energy In – 1000 dollars or 20.000 kwh (industrial price 5 cents per kwh) or 200 kwh per year. Energy Out = zero, absolutely nothing. Maybe you can talk about an energy balance of less than 1. All costs of the coal plant in its lifetime of 50 years is 10,000 dollars per day. Fixed production price (sales price minus taxes and profit) per kwh is 5 cent through the life time of the coal plant. For the daily production price of 10,000 dollars you can buy 200,000 kwh. The coal plant produces every day 10 million kwh. Energy In = 200,000 kwh Energy Out = 10,000.000 kwh. Energy balance 50. It costs 100,000 dollars (i.e. 2,000.000 kwh) per day to operate, maintain, amortize the oil well in its 10-year lifetime. The oil of the well has a production price (sales price minus taxes and profit) of 4,000.000 dollars (i.e. 80,000.000 kwh) per day in its entire lifetime. Energy balance 40. However, coal has only one single purpose: to produce kwh which is its end product. But the oil has several end products that require further production steps (energy consumption) to achieve: gasoline, lubricants, diesel and 6000 more items. My question: is it correct (logical) to use the production price (sales price minus taxes and profit) of the oil at the well head, or do you have to use the end price (i.e. the price which the end consumer pays for all those 6000 different end products) in order to find the energy balance of crude oil? In my opinion you must base the energy balance on the sheer production price. The sales price includes for instance profit for the investors and taxes. Coal has only one production aim – to turn heat into kwh through a coal fired power plant. Crude oil has several production aims – for instance refinery and integration into 6000 different products – these products must also be transported. With each taxation or profit step the energy is ploughed back into the community where it is consumed spending (using) money (slow dissipation). With each conversion step energy is turned into heat or movement (sudden dissipation) and only part of it is left as wages to power plant workers and bus- or truck-drivers. The connectedness of energy and money is decisive in my thinking. how do you commmodify water? ever try to live without it? there’s a great Twilght Zone episode with a guy giviing gold bricks for a sip of water. The bucket you put water in definitely has an energy cost associated with it. In fact, we need a fairly high level of civilization to get today’s buckets. How would a hunter-gatherer have gathered water from a spring and carried it elsewhere? Perhaps in a hollowed out gourd, for a short time, and a short distance. But it would mostly be of use to people who transported themselves to the spring. How do you drill down 10 meters to a water source? How would a hunter-gatherer drill down 10 meters to a water source? Why don’t you just walk to the outlet of the well spring instead? I would guess that the amount of water gathered from free flowing springs is negligible, as a percentage of the world water supply. Given the number of people in the world today, the water will need to be tested for purity. It may also need to be treated. If it is to go anywhere else, you will need to have a way of transporting the water, pumping it uphill if necessary. This is one reason that EROI “at the wellhead” gives an absurdly low-biased estimate of the energy cost. Coal is often said to have an energy balance of 50:1 “at the wellhead.” It is a cheap to extract fuel, if you don’t have to transport it anywhere, and you don’t have to clean up the pollution problems. Doing all of the extraction, refining , and distribution requires a whole economy. It requires roads, schools, iron ore mines, steel mills, a medical system, and many other things. That is why not too much can be spent on the extraction part, or on the extraction and distribution part. Yes, exactly. The enormous ‘surplus energy’ goes into paying all these things. Nope, <25% tested.. at least for reliable brands. What if you turn on the heater? My mother has reached aged 96, and having her health issues….not unexpected. She still managed to go out to the park with her lapdog, Cricket, and Doctors appointments. On remark that she repeats…”In my DAY”. (born 1922). Remembers the “Rag Man”, with horse and buggy crying out…”Rags for sale!”, the ice man for my grandfather’s pantry, the coal truck that unloaded a pile in the basement for the furance, the milkman delivering glass bottles in the wee morning hours…and very few automobiles on the road. They built apartments near where she lived….The Garden Apartments….that were there before the buildings..beautiful food gardens walking distance. Never mind trollies on the main boulevard…all in NE New Jersey. And the internet…hard to grasp.likes the instant answers to her many questions. Makesa some things more clear. I’m only sixty and I remember the rag and bone man with his horse and cart, and the initiate tinkers who used to sharpen kitchen knives for a tanner. They were a regular feature of London life well into the 1960s. Interesting post, UB. My father was born in 1927 and he use to say the only tech they had when he was a kid was a radio and a phone. No car yet although they were available. He said there were 2 billion in the world in the year he was born. Now there’s 5.5 more. I’m not much better…when I was born there were 3 billion . We had in addition to a phone, AM radio, a black and white television set that received three channels, ABC, MBC and CBS and a couple of UFH stations. This being in the early 1960s, there were lots of cars on the road…in my mind the Chevy Impala, Ford Mustang, stand out in my mind with gas selling for 24.9 cents a gallon…and rising to a whopping 29.9 cents. No air conditioning for us, though some other folks had it with a color TV! I was a paper boy for “The Record”. and the whole week home delivery was .75 cents, and they may have given me a tip., I felt rich! “A diplomatic row between France and Italy has deepened, with France complaining of “unfounded attacks and outlandish claims” by Italian leaders. France recalled its ambassador to Italy for talks on Thursday, saying the situation was “unprecedented” since the end of World War Two. “It comes after Italian Deputy PM Luigi Di Maio met French “yellow-vest” protesters near Paris on Tuesday. France warned him not to interfere in the country’s politics. “Germany will not become dependent on Russia for gas due to Russia’s Nord Stream 2 pipeline, Chancellor Angela Merkel said on Thursday, stressing that it was crucial to ensure Ukraine remained a transit country for gas. ““Do we become dependent on Russia due to this second gas pipeline? I say ‘no’, if we diversify at the same time,” Merkel told a news conference in Bratislava, where she met the leaders of the Visegrad group – Czech Republic, Hungary, Poland and Slovakia. Where does this gas from the Ukrainian pipeline come from? It doesn’t originate or transit Russia, by any chance? One wonders who is the greatest alcoholic by now, Juncker or May…….. The endless negotiations would drive anyone to drink. Political discourse is proving ever less effective at mitigating the social fractures wrought by declining prosperity. It is frustrating for all concerned. May has a very heavy type of diabetes. I doubt that she drinks much. But this sickness and the medicine you take along, can make people act funny and strange. But maybe she is just naturally so. Relations among countries go downhill all over. Right. New international organizations are a way to use surplus energy. At least as long as prosperity lasts. The world is much more interconnected than before – the range of products we use every day prevents us from isolation: the specific environments, we live in, can not sustain our populations, we need exchange much more than before. That is why Brexit is failing!!! The EU was born out of necessity after the WWII: the states existing alone could and can not survive. There may be a termporary desintegration (like I know from my experience of the Czechoslovakia breakup), but it can not last. There was an article in Slovak which stated that the basis for Brexit was migration control, not economy (https://www.postoj.sk/40076/podstatou-brexitu-bola-kontrola-migracie-nie-ekonomika). I do not want to discuss the contents of the given article, but the observation that the main problem was the migration control is something I can agree with. This dilemma of the ageing societies seeing their decline is something that is hard to solve, especially in case of Britain, which lost a lot of energy per capita due to the fall of the domestic oil production, as the decline in energy per capita transforms into the decline of the population. “Rebuild every single building in the U.S. and upgrade it or replace it for state-of-the-art energy efficiency.”” Can you imagine the cost of that? Imagine how much finite fossil fuel energy that will consume. Imagine the amount of waste that will be dumped in to landfills to achieve that goal. Millions of A/C and heat units, refrigerators, stoves, appliances, lights, roofing materials, insulation, siding, doors and windows will be scrapped. The resource drain to do this would be tremendous. And this is “green”. How is throwing all that embedded energy in the trash “green”? How efficient is it to throw away perfectly good, infrastructure? in our finite world, conservatives are green, pie-in-the-sky liberals are the profigate world destroyers. The way I see it from a political perspective..Is that the right doesn’t believe in a finite world…And the left does believe in a finite world..But thinks we can transition through technology etc.. I can say though every since I found this blog and started criticizing renewable’s..I have upset some of my liberal friends..I even belong to a local science club that I pay a membership for..And I said something on FB last year that renewable’s were a false hope..And the leader of that science club went bonkers on me on FB…And I showed her numerous scholarly references..Then she went and blocked me..So now I can’t go to any of their science meetings because I don’t want to be nervous around her..
I’ll go with you and we can stare her down together. If our problem is lack of demand, I suppose that destroying everything and adding a whole lot of debt to pay for the replacements is as good a strategy as any for keeping the debt bubble growing. That is what is in danger of collapsing. With a high enough debt bubble, we can get more fossil fuels out because commodity prices will be higher. So, in theory, this action might kick the problem down the road for a short time. I would say conservatives brag about being world destroyers. But Dims, being capitalist, are true destroyers also. The repugs sort of have an advantage, as they can use both hands. The Dims often have to cover their noses with one hand. It is ludicrous!!!!! Eco this, eco-that. Poppycock. It is all consumption of finite resources. The production of such bricks must be very energy intensive. And I am doubtfull about their insulation properties in comparison to modern construction materials. It is based on the belief that we can somewhat go back, that we can return to old good days and ways. But, what makes the temperature differential? A gas furnace? LOL! Curiously, I read the other day that the super-rich are moving away from ‘smart’ homes run by apps, preferring to indulge in the olde worlde joys of actually pulling curtains across, turning bath taps by hand , etc. I visited a cousin a while back, in her ultra-fancy expensive home. I almost needed a training course to figure out how to get the shades on the windows up and down. The house was so big that I couldn’t call to her, if I wanted to find out where she was. I had to call her on the phone. Her husband’s home office was in a separate building. I couldn’t see that all of this “stuff” made anyone any happier. I had visited her earlier a few years back, in a different house, when they had children at home. There, they needed an intercom to call the children to a meal. One of her big problems now seemed to be lack of exercise. All of these labor saving devices just seemed to make the situation worse. I think she also means that disposal also includes the inhabitants. For Ocasio to even suggest a complete transition to zero carbon emissions for the entire country in 10 years is so absurdly out of touch it’s comical. I can’t believe she was allowed to put that junk into a proposal. She just eliminated any credibility she had. Really makes Dems look bad, which is not a good idea now that they finally got back the House. This is a non-starter and the politically bad repercussions from it have only just begun. What politician today has any credibility when it comes to making promises of future prosperity? And who among them can even be blamed for not having it, any more than the average human. Whether EVs or humvees, it ain’t happening! so just a minor part of the delusion. Sooner or later someone would have to advice AOC she got an excellent great plan there with one small proviso, that ~3-4x families have to move into one single unit/upgraded house and share it. Otherwise it’s unreal wastage of material, money and nature at this point of our trajectory.. And even at that she would have to double cross mil industrials cutting their budget ~75% for two decades to pay for it, lolz..
Good luck with that, you mo-r-on.. I guess I just hate these fakey candidates. Russia or the Bolsheviks tried that. It did not end well for most. If it got crowded, they could always use the second home down on the Crimea. – I doubt her measure will pass any time soon. – Cortez Lite could accommodate lower skilled workers, artists for murals, etc. Old appliances would still waste energy, but that might not be the essential problem, or be one that is impossible to work around or mitigate. Repair and maintenance ought to be demand raisers too. It is the debt that creates the demand. The huge amount of debt allows all kinds of new buildings to be built in the place of old building. It allows workers to be hired to carry out these plans. The wages of the workers is part of what raises demand. The new/refurbished buildings need a lot of resources. The demand from the building projects, plus the demand from the workers on the projects who can now afford cars and homes, raises the prices of commodities, including oil, coal, natural gas etc.. With these higher prices, extraction of these resources becomes (sort of) profitable, at least temporarily. Governments may need to print money to go along with this, to further allow citizens to afford the higher cost goods made with the higher cost resources. There was a huge programme of eco-upgrades in the UK, principally wall insulation: it just attracted ‘cowboy’ builders (sorry cowboys, as you actually know your job) and was a disaster, ruining properties, particularly in the public sector. Still, for a time any old idiot could get a job doing it – so, yes, a ‘stimulus’! I understand that in the US, there is (or perhaps was) some sort of program under which homeowners could get a loan, without actually having to qualify for it, for a new furnace, if it was more efficient than the old one. I think it also applied to insulation upgrades, and perhaps other things. I remember reading that sellers of furnaces figured out early on that if a family could not afford a new furnace, and could not qualify under most lending schemes for a loan for a new furnace, this was a way these people could easily get loans that they really couldn’t afford. Any new furnace was, almost by definition, more efficient than one installed 20 years ago, so virtually any new furnace qualified. With this scheme, people could “afford” a new air conditioner as well. What is the preferred PC term these days? Greg my wife and I had a similar discussion on this. AOC has some good ideas(see Jim Kunstlers latest blog post). AOC is an energy an economic illiterate and hasn’t the slightest understanding of the role of fossil energy to the economy. She things all energy is fungible. She also things electricity is an energy “source.”100% “renewables” in 11 years is of course impossible. Wind and solar are not renewables anyway. Ask if she knows what a dissipative structure is, what the second law of thermodynamics states, what entropy is etc etc etc. There is no reason to insulate most residential structures in the country as most of the homes are suburban homes which will be abandoned when transportation access to them ceases. There is a reason to build all new structures to high insulation standards in communities that might have a future such as towns along navigable waterways or ports and that is now mandated in parts of the world and in many communities like my own in Jackson WY. It is far cheaper to build insulated structures within the McMansions by subdividing up existing areas and insulating those stud walls to make in essence a smaller insulated space contained within the same building envelope. In the old days the big farmhouses would close off unused parts of the house. There is no need to get our nappies in a knot fussing over silly suggestions that have zero chance of being enacted. She doesn’t understand that our complex economy is largely self organized, and imposing order from the outside is impossible and the consequences unpredictable. She has a good heart and she is worrying about the looming debacle of environmental planetary destruction brought on largely by human activity. We all do Alexandria! She thinks that we need to get to renewable energy for the entire society(world?) in a decade. She is wishin’ and hopin”for a Utopia which cannot happen for any number of reasons that posters here understand without me having to enumerate them by preaching to the choir. She is right that as a society we need to get to a decarbonized economy and I have no doubt that we will but that process will involve a collapse and extinction of the current complex fossil fuel- based globalized civilization we currently inhabit. Progress like thermodynamics moves in only one direction and this civilization cannot maintain its current structure by a change in energy inputs as she seems to believe. Collapse is not only inevitable but necessary because only then can a new structure more in line with what she thinks we need spring up. My wife thinks I need to send AOC some books like Joe Tainters “The collapse of complex Societies” and others. I think she needs to just follow this blog of Gail’s to help clarify her thinking. Politics no matter how well intentioned simply does not have the tools to deal with the terminal illness this society faces. Politicians know that citizens want to be told that good times are ahead, no matter how unrealistic that story is. They are good a coming up with suitable (but, in some sense ridiculous) stories to tell people, because citizens are so completely unknowledgeable about what the real problems are. The accepted models of economics that are based on curve fitting make no sense, because they miss turning points. They convince people that good times can last forever. She is simply following an established tradition. My condolences to folks who live in Australia. The oil shortages may be marked by World Wars or depression. I wouldn’t count on high prices, though.